Biathlon is a great sport for people who are in the military forces of Scandinavian countries. Which kind of makes it just like every other sport in the Winter Olympics. 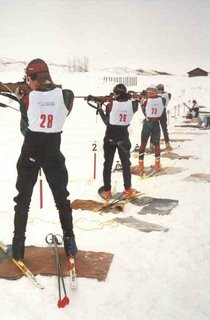 Our high school has a biathlon team. I am a great skiier and a pretty good shot, but I am not allowed to compete. My parents don't have Family Health Insurance so my school won't allow it. I am so disappointed.